In the stories, you’ll meet a serial killer, alien snails, a petulant eleven-year-old, a beloved astronaut, a laid-off worker, and many others. Two poems provide a transition from fiction to opinion. The short essays castigate, decry, praise, and skewer our personal, local, national, world, and cosmic conditions. 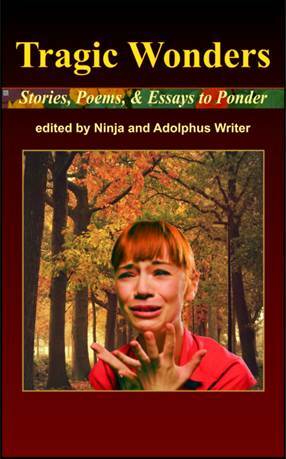 Mandated Memoranda’s second eBook, Tragic Wonders – Stories, Poems, and Essays to Ponder, edited by Ninja S. and Adolphus Writer, was first available December 2013. These writings are meant to engage readers in a reality that we all deny daily, whether we profess faith in Christ, are ambivalent, or are hostilely opposed to religion. Click here to read an excerpt. Learn More on Amazon’s landing page. Tragic Wonders, edited by Ninja and Adolphus Writer is a collection of short stories, essays and poems that ponders over the difficult notions that life so often delivers to us. The words written on the page deal with situations which put the characters in distressing circumstances, often forcing them to face their deepest fears in order to overcome the problems at hand. This book causes the reader to evaluate how they view themselves and the world around them through these collected narratives. The title is fitting for the elements that make up this book, as most of the stories combine both components of wonder and tragedy. Through twenty-one stories, two poems, and eighteen essays, the voices of all of the contributors collide in one massive heap, resulting in a delectable conversation about how things are, and if there is any real way to change how things are meant to be. This is not your average book, as the stories and essays contained within vary a great deal in tone and theme. Nevertheless, the overall messages of trying to search for meaning, and going out into the unknown to find something more than what has already been discovered here on Earth, permeate the words that are constructed delicately on every page. The two poems that are sandwiched between the beginning section of fiction, and the ending portion of writers’ opinions are reflective points, which balance the collection nicely. This isn’t an easy read, but it is a rewarding one, as the stories are crafted with great care. All in all, if you are the kind of reader who likes to have their own assumptions on how reality truly exists questioned by the written word, then this is sure to be an enjoyable book for you. This title has not yet been released, check for it soon! Now that Ms. Smith’s work is done and in production, we at Mandated Memoranda Publishing LLC are taking on a new fiction book. This is a collection of short stories with the tentative title: “Horrors of the Heart”. Adolphus Writer will again explore how we deal justly or unjustly with the experiences we are dealt in this life. He has a stable of contributors that are composing horror and science fiction stories plus specific essays on this theme. The authors will post excerpts from their stories and essays over the next few months. Please read them and comment. Thank you.